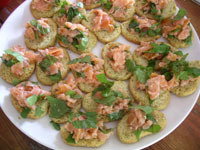 Smoked salmon, ground elder, a squirt of lemon and a dash of pepper. Don't be afraid to experiment! I’ve stopped fighting the weeds. In fact, at an event I arranged yesterday I decided to use them to the full. And what a delightful range of taste surprises they delivered! Some types of edible weeds bring back long-forgotten flavors (if they are edible they will have been eaten by someone sometime!) which our frequently tame-tasting greens such as spinach and iceberg lettuce cannot deliver. Anyone who reads my island blog knows by now that my garden is home to a flourishing colony of bishop’s goutweed (or ground elder). My elderly neighbor who is a devoted gardener sings its praises as an alternative to cooked spinach. However, as I picked a leaf and chewed for a while, I became interested in the delightful qualities of this zesty, juicy leaf uncooked. The thought of throwing it into the blender to make a pesto struck me and soon I was dipping my carrot sticks into an absolutely fabulous bowl of ground elder pesto. At my event, the guests, many of whom fight ground elder in their gardens too, were at first aghast that I could consider serving this up as food but after tasting wanted my recipe. Here it is. Blend all ingredients in a food processor and serve as a dip for crisp bread or cut vegetables. On the same day as I created this recipe I also noticed that the nettles had grown to giant size in the fertile soil just outside my garage. I clipped them down and placed them in my prettiest basket. Clipped nettles can make your fingers burn but their smell is divine and awakens that wonderful feeling of summer and soft grass. I needed a creamy alternative to the pesto and so cleaned out my blender and combined the nettle with a bit of cream cheese. The result provided a perfect balance to the other dip. I also dolloped this cream cheese mixture onto small rounds of dark bread to serve with drinks. Very good indeed. Blanch the nettles in a bit of boiling water so that they soften and the sting goes away. Drain and allow to cool. Squeeze as much liquid out of the nettles as possible and form a ball out of them. Chop into pieces and throw into the blender with the cream cheese. Season with salt and pepper. 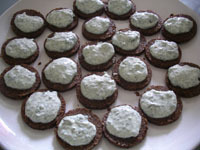 Use as a dip or a topping for bite-size open sandwiches. 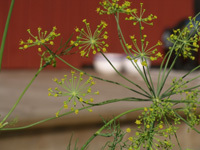 So, what’s so Scandinavian about using weeds in the kitchen? There is an old saying in the Scandinavian kitchen coined by its first cookbook writer Cajsa Warg (1703-69) which says, “one takes what one has.” I’m taking what I have. Why don’t you try it too. IMPORTANT NOTE: Not all weeds are edible. Please do your research before experimenting and ingesting!